Trees are fascinating. They are all around us, we see them every day, they are beautiful and each provides many ecosystem services; the more you learn about them, the more amazing they become. Take bark for instance. Every tree has bark – it is the outer skin of the tree, and, like humans, comes in a variety of colors. All trees grow bark in the same way: tissue cells just under the bark called the cambium divides, allowing the bark to stretch and the tree to increase its diameter. On either side of the cambium, the phloem and xylem add a layer each year, creating the growth rings visible in the interior when a tree is cut. Xylem conducts water and nutrients from the roots to the tree canopy and provides strength to the tree. Phloem transports vitamins, amino acids, sugars and hormones throughout the tree. If damage occurs to the bark, trees often die. Healthy bark means a healthy tree. Insects and pathogens can hurt a tree, particularly when combined with mechanical damage (weed eaters or mowers scuffing the bark, etc.). However, trees do a remarkable job of compartmentalizing damage by creating scar tissue around injuries and separating it from the rest of the tree. 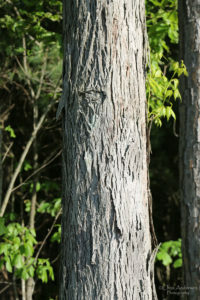 One of the most interesting of barks is that of the shagbark hickory (Carya ovata). On mature trees, vertical lengths of bark pull away from the trunk and turn up on the ends. As with sycamore, white oak and birches, this sheeting habit provides valuable protection to many insects, bats, butterflies, caterpillars, spiders and other forest life. Many Native Americans traditionally gathered and roasted the nuts, a tasty and highly nutritious fall food. Hickory “milk” is made by pounding the nuts into a paste, boiling and pouring off the nutritious liquid to be used in a variety of dishes. The name “hickory” comes from the Algonquin word “pawcohiccora”, meaning hickory milk. Carya, the genus name comes from the Greek name for the walnut tree (karya); ovata, the species name, is Latin for ovate, referring to the egg-shaped buds, nut husk and leaves. Harvest time is in September and October, when the nuts are on the ground, making for easy gathering. 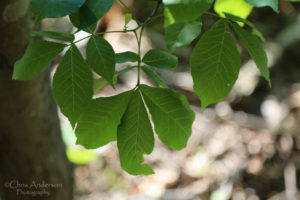 There are four hickories native to Virginia, including shagbark, mockernut, pignut and bitternut with the nuts of the shagbark being the thinnest shell making them the easiest to harvest the meat inside. 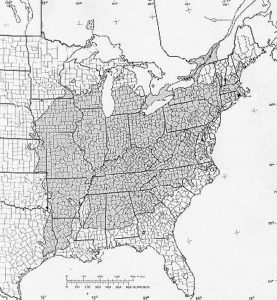 Shagbark hickories grow in the Piedmont and mountains of Virginia but do not grow along the eastern side of the state or the coastal plain. They extend as far west as Missouri, but tend to be scarce across the entire area and don’t tend to colonize or grow in great abundance in most areas. Some caterpillars feast on the leaves but the tree is generally-pest resistant. They thrive in full sun but can handle some shade, enjoying moist, even wet conditions. In the landscape, it is important to provide them plenty of space as they can reach heights of 100 feet and should be planted in areas where their nuts won’t impact vehicles, walkways or create maintenance issues. They can live to be 350 years or more and, but due to their long taproot, do not transplant particularly well after reaching a certain size (though White House Natives takes particular care in the careful digging and moving of all stock). The wood of shagbark hickory is very heavy, hard, tough and very strong. 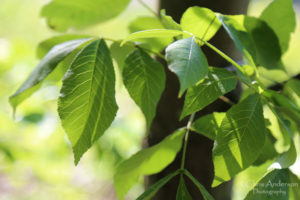 According to the Virginia Department of Forestry, no other commercial species is its equal in combined strength, toughness, hardness and stiffness. It is used for tool handles, furniture, flooring, sporting equipment, charcoal and fuel wood. Shagbark hickory belongs to the Juglandaceae family and can hybridize with pecan trees. In recipes, the sweet, white shagbark hickory nuts can be substituted for pecans.. 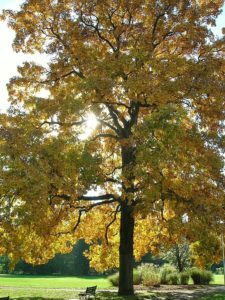 The Virginia champion shagbark hickory grows in Southampton and towers almost 130 feet tall. The U.S. champion currently lives in Anne Arundel County, Maryland. Squirrels relish the nuts, as do deer, bear and other mammals. If providing habitat and protection to many small insects and feeding wildlife is a goal in the landscape, shagbark hickory is a great choice.